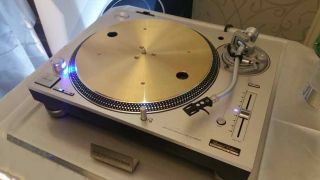 Technics confirms UK price for SL-1200GAE turntable as £2799 | What Hi-Fi? Technics has confirmed the limited edition Technics SL-1200GAE turntable will go sale in the UK for £2799. The turntable went on sale in Japan yesterday, with all 300 models selling out in a matter of minutes. 1200 units of the limited edition GAE model will ultimately go on sale worldwide, and Technics has now confirmed the UK models will set you back £2799 - a fair conversion rate on the $4000 quoted by Technics at the start of the year. It's not unusual for US prices to be all too similar to UK prices, so it's fair to say we feared the Technics '1200GAE could be on the pricey side. While the new deck isn't going to match the original £1200 price of the SL-1200, it's perhaps a little closer than we might have thought. The limited edition deck, which is due out around June in the UK, will be followed by the SL-1200G later in the year. This deck will have a few minor design tweaks but will crucially be available in much larger numbers. Technics hasn't confirmed the price of the standard model but we'll assume for now that it will be similar if not the same. Technics spoke to What Hi-Fi? earlier in the year to explain the price, saying the deck was a complete redesign, requiring a brand new manufacturing process and using all new tools - and this made the whole process rather expensive. Thankfully, it appears it's not £4000 expensive.